they've collected this year at 4MRMarket. You've probably noticed, but in addition to the fine produce and food products that we feature in our reports most weeks, 4MRMarket is also a hotbed of talented and enterprising artisans --a small business incubator for the up and coming art entrepreneur. 4MRMarket has hosted more than a half dozen different artisans this year, with a variety of crafts represented. Depending on the week, you can get items as diverse as jewelry, furniture, placemats, photos and kids clothing. For example, this weekend, you can get hand woven placemats, napkins, dish towels, et cetera at Uncommon Knits. 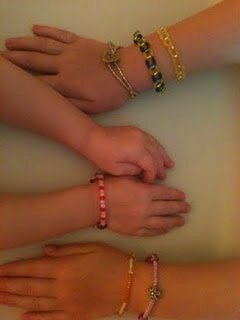 Or hand made jewelry designed by Andrea D'Ambrosia. Craftsman-made wood tables and furniture made by Chris Waters should be there, as well as the beautiful photography of Ron-RLR Designs. But we always expect a few surprises, so please stop by. Congratulations to our raffle winner, Amanda Shapiro, who picked up $100 to spend at the farmers market and create her own ideal 4MRMarket bag! 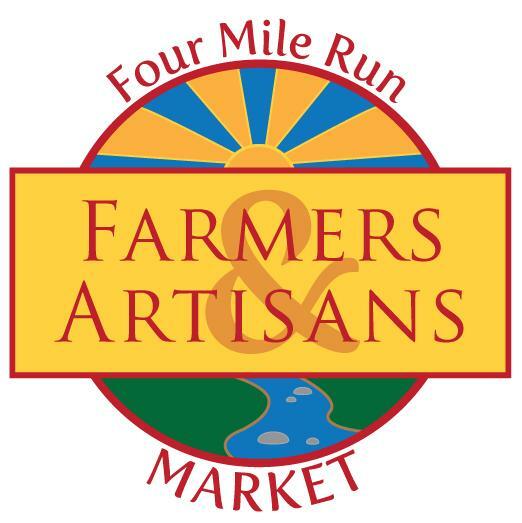 Several other winners have been selected to receive a free Four Mile Run Farmers & Artisans Market t-shirt as well. We've contacted winners already, so if you haven't heard from us, prepare for the next great promotion! All you have to do is come out and shop at 4MRMarket as so many of you do every week, anyway! Thanks for your support! Starting next week, bring your re-usable Buy Fresh, Buy Local bag to the market and you can enter to win $5 to spend at the market. Several winners will be selected! We have more bags to give away, so stop by the 4MRMarket tent and ask a market manager. Remember to catch us early to beat the heat! We're open at 8am, before the summer sun cranks up. Check out the photo of the deep red watermelon and try to pretend you don't want a bite! They're delicious, and in season with so many other great produce items right now!